Mary and Joseph arrived at the Smith's house for there fifth overnight stay. Here they are sharing a hot chocolate. Mary and Joseph arrived at the Lee's house for there sixth overnight stay. Here they are sitting on a cupboard watching whats going on. After spending there overnight stay at the Lee's house, they were then taken to ParkRun in Greenhead Park this morning before there next overnight stay. Once Mary and Joseph had arrived at the Jones's house they first had a rest and then after spending some quiet time making an Angel, Mary and Joseph started reading up about parenting - Mary felt that there was only two or three weeks left to prepare. Joseph was still apprehensive about the nappy change...but had an idea for making the first ever King size bed!! 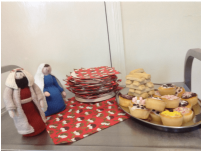 ​Today Mary and Joseph arrived at Lindley Methodist Church's Parent and Toddler Group for Christmas party food this morning - this looks more like it! Mary and Joseph then arrived at the Stainton family! Mary had a quiet day looking at the countryside and relaxing on the sofa! Watching us being busy for Christmas!!! ​Mary and Joseph arrive at the Skillen family and are admiring their lovely christmas tree. Mary and Joseph arrive at the McNeill family and find a Travel Logde especially for them! ​​Mary and Joseph arrived at Lindley Methodist Church for the Carols round the Crib Service at 5pm. They both decided they'd take a well earned rest! A busy time with the Buckley Family! Lots of fun games, art and craft projects and a trip to the garden centre to buy Christmas lights.